23 December 2004: A Happy New Year! 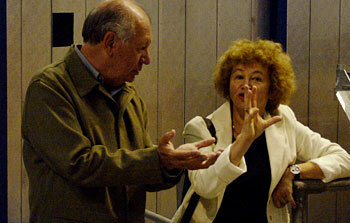 22 December 2004: On December 9-10, 2004, the ESO Paranal Observatory was honoured with an overnight visit by His Excellency the President of the Republic of Chile, Ricardo Lagos and his wife, Mrs. Luisa Duran de Lagos. The high guests were welcomed by the ESO Director General, Dr. Catherine Cesarsky, ESO's representative in Chile, Mr. Daniel Hofstadt, and Prof. Maria Teresa Ruiz, Head of the Astronomy Department at the Universidad de Chile, as well as numerous ESO staff members working at the VLT site. The visit was characterised as private, and the President spent a considerable time in pleasant company with the Paranal staff, talking with and getting explanations from everybody. 10 December 2004: The Tarantula Nebula is one of the most impressive views in the Southern sky. 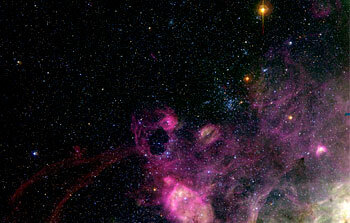 Visible to the unaided eye in the Large Magellanic Cloud (LMC), a satellite galaxy of the Milky Way that is located in the direction of the southern constellation Doradus at a distance of about 170,000 light-years, this huge nebula is the prototype of what astronomers refer to as a "Giant HII region". In this complex of glowing gas and very hot and luminous stars, the gas is mainly composed of protons and electrons, which are kept apart by energetic photons emitted by the stars in this area. 1 December 2004: Images of beautiful galaxies, and in particular of spiral brethren of our own Milky Way, leaves no-one unmoved. It is difficult indeed to resist the charm of these impressive grand structures. Astronomers at Paranal Observatory used the versatile VIMOS instrument on the Very Large Telescope to photograph two magnificent examples of such "island universes", both of which are seen in a southern constellation with an animal name. But more significantly, both galaxies harboured a particular type of supernova, the explosion of a massive star during a late and fatal evolutionary stage. 24 November 2004: One of the currently hottest astrophysical topics - the hunt for Earth-like planets around other stars - has just received an important impetus from new spectral observations with the MIDI instrument at the ESO VLT Interferometer (VLTI). An international team of astronomers  has obtained unique infrared spectra of the dust in the innermost regions of the proto-planetary discs around three young stars - now in a state possibly very similar to that of our solar system in the making, some 4,500 million years ago. Reporting in this week's issue of the science journal Nature, and thanks to the unequalled, sharp and penetrating view of interferometry, they show that in all three, the right ingredients are present in the right place to start formation of rocky planets at these stars. 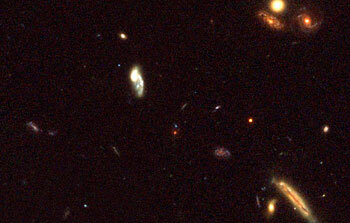 18 November 2004: Star formation is one of the most basic phenomena in the Universe. Inside stars, primordial material from the Big Bang is processed into heavier elements that we observe today. In the extended atmospheres of certain types of stars, these elements combine into more complex systems like molecules and dust grains, the building blocks for new planets, stars and galaxies and, ultimately, for life. Violent star-forming processes let otherwise dull galaxies shine in the darkness of deep space and make them visible to us over large distances. 2 November 2004: On June 8, 2004, Venus - the Earth's sister planet - passed in front of the Sun. This rare event - the last one occurred in 1882 - attracted the attention of millions of people all over the world. 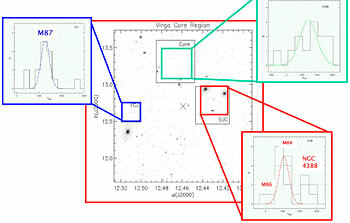 29 October 2004: Taking advantage of the very high spatial resolution provided by the Very Large Telescope Interferometer, a team of French and Swiss astronomers  has measured directly the change in angular diameter of four southern Cepheid variable stars over their pulsation cycle. When combined with spectroscopic radial velocity measurements, this allowed the astronomers to measure very accurately the distances of these stars in a quasi-geometrical way, and to calibrate the zero-point of the Cepheid Period-Luminosity empirical law. These observations constitute a fundamental step towards an independent verification of the extragalactic distance scale by interferometry. 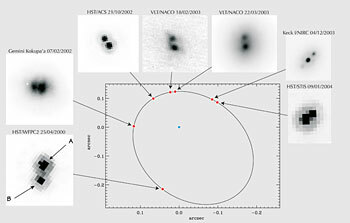 22 October 2004: An international team of astronomers  has succeeded in measuring with high precision the velocities of a large number of planetary nebulae  in the intergalactic space within the Virgo Cluster of galaxies. For this they used the highly efficient FLAMES spectrograph  on the ESO Very Large Telescope at the Paranal Observatory (Chile). These planetary nebulae stars free floating in the otherwise seemingly empty space between the galaxies of large clusters can be used as "probes" of the gravitational forces acting within these clusters. They trace the masses, visible as well as invisible, within these regions. This, in turn, allows astronomers to study the formation history of these large bound structures in the universe. The accurate velocity measurements of 40 of these stars confirm the view that Virgo is a highly non-uniform galaxy cluster, consisting of several subunits that have not yet had time to come to equilibrium. These new data clearly show that the Virgo Cluster of galaxies is still in its making. They also prove for the first time that one of the bright galaxies in the region scrutinized, Messier 87, has a very extended halo of stars, reaching out to at least 65 kpc. This is more than twice the size of our own galaxy, the Milky Way. 29 September 2004: Today, September 29, 2004, is undisputedly the Day of Toutatis, the famous "doomsday" asteroid. Not since the year 1353 did this impressive "space rock" pass so close by the Earth as it does today. 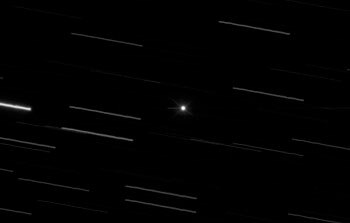 Visible as a fast-moving faint point of light in the southern skies, it approaches the Earth to within 1,550,000 km, or just four times the distance of the Moon. 14 September 2004: Anybody who visits a high-altitude astronomical observatory at this time of the year will be impressed by the beauty of the Milky Way band that stretches across the sky. Compared to the poor views from cities and other human conglomerations, the dark and bright nebulae come into view together with an astonishing palette of clear stellar colours. 10 September 2004: Is this newly discovered feeble point of light the long-sought bona-fide image of an exoplanet? A research paper by an international team of astronomers  provides sound arguments in favour, but the definitive answer is now awaiting further observations. 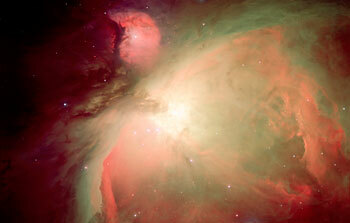 On several occasions during the past years, astronomical images revealed faint objects, seen near much brighter stars. Some of these have been thought to be those of orbiting exoplanets, but after further study, none of them could stand up to the real test. Some turned out to be faint stellar companions, others were entirely unrelated background stars. This one may well be different. In April of this year, the team of European and American astronomers detected a faint and very red point of light very near (at 0.8 arcsec angular distance) a brown-dwarf object, designated 2MASSWJ1207334-393254. 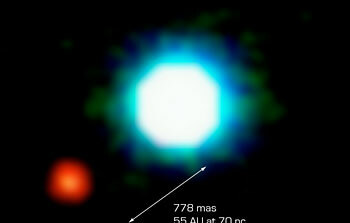 Also known as "2M1207", this is a "failed star", i.e. a body too small for major nuclear fusion processes to have ignited in its interior and now producing energy by contraction. 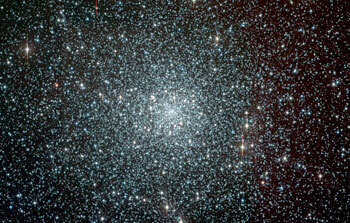 It is a member of the TW Hydrae stellar association located at a distance of about 230 light-years. The discovery was made with the adaptive-optics supported NACO facility  at the 8.2-m VLT Yepun telescope at the ESO Paranal Observatory (Chile). The feeble object is more than 100 times fainter than 2M1207 and its near-infrared spectrum was obtained with great efforts in June 2004 by NACO, at the technical limit of the powerful facility. 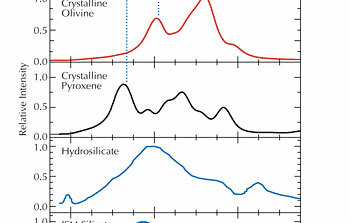 This spectrum shows the signatures of water molecules and confirms that the object must be comparatively small and light. None of the available observations contradict that it may be an exoplanet in orbit around 2M1207. Taking into account the infrared colours and the spectral data, evolutionary model calculations point to a 5 jupiter-mass planet in orbit around 2M1207. Still, they do not yet allow a clear-cut decision about the real nature of this intriguing object. Thus, the astronomers refer to it as a "Giant Planet Candidate Companion (GPCC)" . Observations will now be made to ascertain whether the motion in the sky of GPCC is compatible with that of a planet orbiting 2M1207. This should become evident within 1-2 years at the most. 25 August 2004: A European team of astronomers  has discovered the lightest known planet orbiting a star other than the sun (an "exoplanet"). The new exoplanet orbits the bright star mu Arae located in the southern constellation of the Altar. It is the second planet discovered around this star and completes a full revolution in 9.5 days. With a mass of only 14 times the mass of the Earth, the new planet lies at the threshold of the largest possible rocky planets, making it a possible super Earth-like object. Uranus, the smallest of the giant planets of the Solar System has a similar mass. However Uranus and the new exoplanet differ so much by their distance from the host star that their formation and structure are likely to be very different. This discovery was made possible by the unprecedented accuracy of the HARPS spectrograph on ESO's 3.6-m telescope at La Silla, which allows radial velocities to be measured with a precision better than 1 m/s. 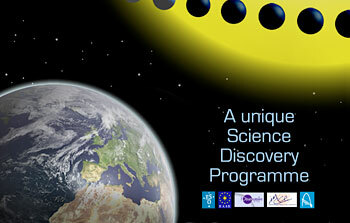 It is another clear demonstration of the European leadership in the field of exoplanet research. 24 August 2004: The European Southern Observatory, the Max-Planck-Institute for Extraterrestrial Physics (Garching, Germany) and the Nederlandse Onderzoekschool Voor Astronomie (Leiden, The Netherlands), and with them all European astronomers, are celebrating the successful accomplishment of "First Light" for the Adaptive Optics (AO) assisted SINFONI ("Spectrograph for INtegral Field Observation in the Near-Infrared") instrument, just installed on ESO's Very Large Telescope at the Paranal Observatory (Chile). This is the first facility of its type ever installed on an 8-m class telescope, now providing exceptional observing capabilities for the imaging and spectroscopic studies of very complex sky regions, e.g. stellar nurseries and black-hole environments, also in distant galaxies. 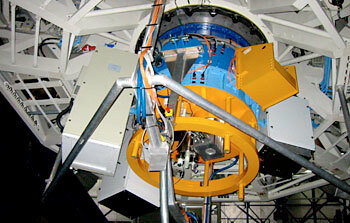 Following smooth assembly at the 8.2-m VLT Yepun telescope of SINFONI's two parts, the Adaptive Optics Module that feeds the SPIFFI spectrograph, the "First Light" spectrum of a bright star was recorded with SINFONI in the early evening of July 9, 2004. The following thirteen nights served to evaluate the performance of the new instrument and to explore its capabilities by test observations on a selection of exciting astronomical targets. They included the Galactic Centre region, already imaged with the NACO AO-instrument on the same telescope. Unprecedented high-angular resolution spectra and images were obtained of stars in the immediate vicinity of the massive central black hole. During the night of July 15 - 16, SINFONI recorded a flare from this black hole in great detail. Other interesting objects observed during this period include galaxies with active nuclei (e.g., the Circinus Galaxy and NGC 7469), a merging galaxy system (NGC 6240) and a young starforming galaxy pair at redshift 2 (BX 404/405). These first results were greeted with enthusiasm by the team of astronomers and engineers  from the consortium of German and Dutch Institutes and ESO who have worked on the development of SINFONI for nearly 7 years. 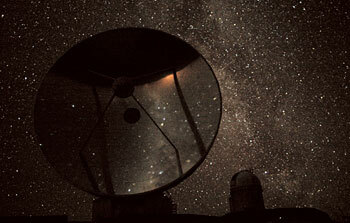 The work on SINFONI at Paranal included successful commissioning in June 2004 of the Adaptive Optics Module built by ESO, during which exceptional test images were obtained of the main-belt asteroid (22) Kalliope and its moon. Moreover, the ability was demonstrated to correct the atmospheric turbulence by means of even very faint "guide" objects (magnitude 17.5), crucial for the observation of astronomical objects in many parts of the sky. 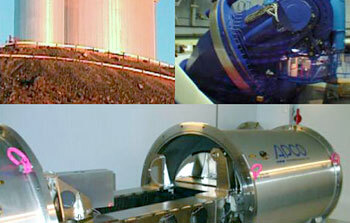 SPIFFI - SPectrometer for Infrared Faint Field Imaging - was developed at the Max Planck Institute for Extraterrestrische Physik (MPE) in Garching (Germany), in a collaboration with the Nederlandse Onderzoekschool Voor Astronomie (NOVA) in Leiden and the Netherlands Foundation for Research in Astronomy (ASTRON), and ESO. 17 August 2004: Observations by an international team of astronomers  with the UVES spectrometer on ESO's Very Large Telescope at the Paranal Observatory (Chile) have thrown new light on the earliest epoch of the Milky Way galaxy. The first-ever measurement of the Beryllium content in two stars in a globular cluster (NGC 6397) - pushing current astronomical technology towards the limit - has made it possible to study the early phase between the formation of the first generation of stars in the Milky Way and that of this stellar cluster. This time interval was found to amount to 200 - 300 million years. 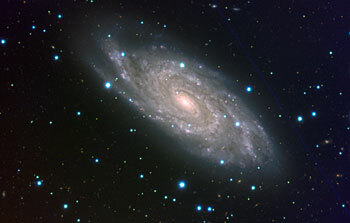 The age of the stars in NGC 6397, as determined by means of stellar evolution models, is 13,400 ± 800 million years. Adding the two time intervals gives the age of the Milky Way, 13,600 ± 800 million years. The currently best estimate of the age of the Universe, as deduced, e.g., from measurements of the Cosmic Microwave Background, is 13,700 million years. The new observations thus indicate that the first generation of stars in the Milky Way galaxy formed soon after the end of the ~200 million-year long "Dark Ages" that succeeded the Big Bang. 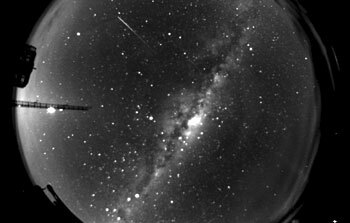 30 July 2004: While observing a supernova in a distant galaxy with the FORS instrument on ESO's Very Large Telescope at the Paranal Observatory (Chile), astronomers were incredibly lucky to obtain serendipitously a high quality spectrum of a very large meteor in the terrestrial atmosphere. 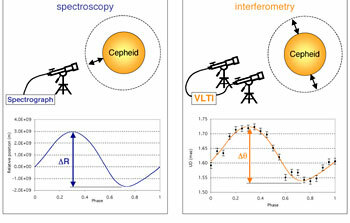 The VLT spectrograph provided a well calibrated spectrum, making it a reference in this field of research. From this spectrum, the temperature of the meteor trail was estimated to be about 4600 degrees centigrade. The serendipitous spectrum reveals the telltale meteor emissions of oxygen and nitrogen atoms and nitrogen molecules. The VLT spectrum was the first to reveal the far red range where carbon emission lines are predicted; the absence of the lines puts constraints on the role of atmospheric chemistry when life started on earth. Because the VLT is tuned to observe objects far out in space, it focuses at infinity. The meteor, being "only" 100 km above the telescope, therefore appears out of focus in the field of view. 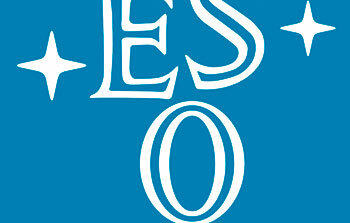 7 July 2004: Finland has become the eleventh member state of the European Southern Observatory (ESO) . The formal accession procedure was carried through as planned and has now been completed. Following the signing of the corresponding Agreement earlier this year (ESO PR 02/04), acceptance by the Finnish Parliament and ratification by the Finnish President of the Agreement as well as the ESO Convention and the associated protocols in June  and the deposit of the instruments of accession today, Finland has now officially joined ESO. 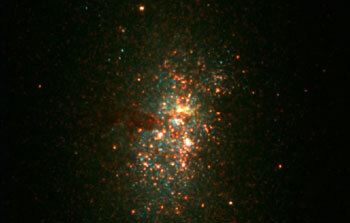 7 July 2004: Current theories of the formation of galaxies are based on the hierarchical merging of smaller entities into larger and larger structures, starting from about the size of a stellar globular cluster and ending with clusters of galaxies. According to this scenario, it is assumed that no massive galaxies existed in the young universe. However, this view may now have to be revised. Using the multi-mode FORS2 instrument on the Very Large Telescope at Paranal, a team of Italian astronomers  have identified four remote galaxies, several times more massive than the Milky Way galaxy, or as massive as the heaviest galaxies in the present-day universe. Those galaxies must have formed when the Universe was only about 2,000 million years old, that is some 12,000 million years ago. The newly discovered objects may be members of a population of old massive galaxies undetected until now. The existence of such systems shows that the build-up of massive elliptical galaxies was much faster in the early Universe than expected from current theory. 30 June 2004: Orion the Hunter is perhaps the best-known constellation in the sky, well placed in the winter for observers in both the northern and southern hemispheres, and instantly recognisable. Just below Orion's belt (three distinctive stars in a row), the hilt of his sword holds a great jewel in the sky, the beautiful Orion Nebula. Bright enough to be seen with the naked eye, the nebula, also known as Messier 42, is a wide complex of gas and dust, illuminated by several massive and hot stars at its core, the famous Trapezium stars. 15 June 2004: Using ESO's Very Large Telescope at Paranal and a suite of ground- and space-based telescopes in a four-year long study, an international team of astronomers has measured for the first time the mass of an ultra-cool star and its companion brown dwarf. The two stars form a binary system and orbit each other in about 10 years. The team obtained high-resolution near-infrared images; on the ground, they defeated the blurring effect of the terrestrial atmosphere by means of adaptive optics techniques. By precisely determining the orbit projected on the sky, the astronomers were able to measure the total mass of the stars. Additional data and comparison with stellar models then yield the mass of each of the components. The heavier of the two stars has a mass around 8.5% of the mass of the Sun and its brown dwarf companion is even lighter, only 6% of the solar mass. Both objects are relatively young with an age of about 500-1,000 million years. These observations represent a decisive step towards the still missing calibration of stellar evolution models for very-low mass stars.